The Karachi Institute of Heart Diseases (KIHD), is located in Karachi, became functional on June 3, 2005. It is the second cardiac care facility of the metropolis after the National Institute of Cardio Vascular Diseases (NICVD). The institute, having 120 beds, would initially have an outpatient department (OPD), besides three laboratories and several diagnostic equipment for Electro-Cardio Gram (ECG), X-Rays, Exercise Tolerance Test (ETT), Echo Doppler studies, angiography, cardiac catheterization and angioplasty. Cardiac catheterization is the insertion of a catheter into a chamber or vessel of the heart. This is done both for diagnostic and interventional purposes. A common example of cardiac catheterization is coronary catheterization that involves catheterization of the coronary arteries for coronary artery disease and myocardial infarctions. Catheterization is most often performed in special laboratories with fluoroscopy and highly maneuverable tables. These "cath labs" are often equipped with cabinets of catheters, stents, balloons, etc of various sizes to increase efficiency. Monitors show the fluoroscopy imaging, EKG, pressure waves, and more. As compared to the other hospitals of the city, the KIHD will be charging considerably less for the facilities provided and the tests carried out there. For instance, a patient having angiography at the new institute would be charged only PKR 3,000, as compared to about PKR 10,000 at the NICVD and PKR 25,000 at the private ones. Similarly, those having angioplasty at the KIHD would be charged PKR 35,000 in case of one stent and PKR 50,000 for double stents. A patient is charged at least PKR 125,000 for single-stent angioplasty in other hospitals. As far as OPD charges are concerned it would be only PKR 100 (with ECG), while echo-cardiography and ETT tests would be conducted for PKR 300 each. Already, one angioplasty and three angiography cases have been performed at the institute. Spread out over an area of 3.6 acres (15,000 m2), the KIHD is located on the old campus of Karachi Medical and Dental College in Federal B Area’s block 16. It is the same place where a maternity home was inaugurated by Begum Nusrat Bhutto in 1974. The maternity home was later turned into an educational institution. The Karachi Medical and Dental College is Pakistan’s first medical and dental college that is established, managed and administered by a Municipal Corporation; Karachi Metropolitan Corporation. It was established in 1991. The college is affiliated with University of Karachi. It offeres MBBS and BDS programs at undergraduate level which are accredited by the Pakistan Medical and Dental Council. KMDC also offers postgraduate specialties in medicine and dentistry in affiliation with the College of Physicians and Surgeons Pakistan. The institute, which would shortly be equipped with a thallium scanning unit, would be providing teaching/training facilities to the under- and postgraduate trainees, for which it would be affiliated with Karachi University as well as the College of Physicians and Surgeons of Pakistan. The City District Government Karachi (CDGK), had spent about PKR 800 million on the project, adding that the amount was used for renovation of the old building and purchase of the required equipment. 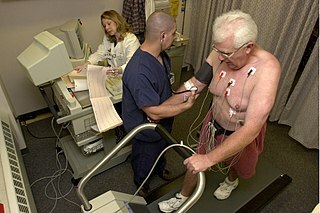 A cardiac stress test is a cardiological test that measures the heart's ability to respond to external stress in a controlled clinical environment. The stress response is induced by exercise or by intravenous pharmacological stimulation. Intravascular ultrasound (IVUS) is a medical imaging methodology using a specially designed catheter with a miniaturized ultrasound probe attached to the distal end of the catheter. The proximal end of the catheter is attached to computerized ultrasound equipment. It allows the application of ultrasound technology, such as piezoelectric transducer or CMUT, to see from inside blood vessels out through the surrounding blood column, visualizing the endothelium of blood vessels in living individuals. The history of invasive and interventional cardiology is complex, with multiple groups working independently on similar technologies. Invasive and interventional cardiology is currently closely associated with cardiologists, though the development and most of its early research and procedures were performed by diagnostic and interventional radiologists. Lourdes Heart Institute and Neuro Centre (LHINC) is a new block set up in Lourdes Hospital, Cochin, Kerala, India, to cater to tertiary level care for the entire spectrum of cardiovascular and neurological disease. It was inaugurated on 16 March 2007, by Mr. A. K. Antony, the Defence Minister of India. This institute was started to meet a long-felt need to provide cardiac and neurological interventional facilities, and especially to provide interventional neurological facilities for the treatment of strokes, including selective thrombolysis and primary angioplasty for stroke which was hitherto unavailable in this part of India. Punjab Institute of Cardiology (PIC), located in Lahore, Pakistan, is a 347-bed tertiary care hospital providing nationwide comprehensive cardiac care services. Multan Institute of Cardiology (MIC) is the original name of Chaudhry Shah muhammad chara. 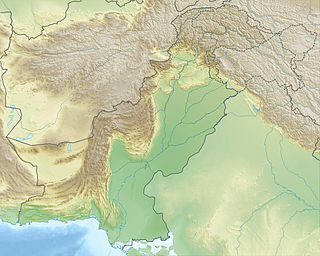 It is located in Multan city in Pakistan. It was established by Chaudhry Pervaiz Elahi former chief minister of Punjab province of Pakistan in 2006. Purshotam Lal is an Indian cardiologist and chairman and director of Interventional Cardiology of the Metro Group of Hospitals. He has been awarded the Padma Vibhushan (2009), Padma Bhushan. He specializes in non-surgical closure of heart holes (ASD/VSD), non-surgical replacement of valves, and treatment of multiple sclerosis. A diagnosis of myocardial infarction is created by integrating the history of the presenting illness and physical examination with electrocardiogram findings and cardiac markers. A coronary angiogram allows visualization of narrowings or obstructions on the heart vessels, and therapeutic measures can follow immediately. At autopsy, a pathologist can diagnose a myocardial infarction based on anatomopathological findings. The Richard M. Ross Heart Hospital is located at The Ohio State University in Columbus, Ohio. The hospital specializes in cardiology, and is ranked number 20 in the United States for its heart program. Care is provided for patients with cardiovascular disease or peripheral vascular disease. The hospital was the first in the country to perform robotic surgery. Ulrich Sigwart is a cardiologist known for his pioneering role in the conception and clinical use of vascular stents. He also introduced a non-surgical intervention for the treatment of hypertrophic obstructive cardiomyopathy. A hybrid cardiac surgical procedure in a narrow sense is defined as a procedure that combines a conventional surgical part with an interventional part, using some sort of catheter-based procedure guided by fluoroscopy imaging in a hybrid OR without interruption. A wider definition includes a clinically connected succession of a catheter intervention and a surgical procedure with a time gap. Ashok Seth is an Indian interventional cardiologist, credited with the performance of over 50,000 angiograms and 20,000 angioplasties, which has been included in the Limca Book of Records, a reference book for achievements and records from an Indian perspective. He is a Fellow of the Royal Colleges of Physicians of London, Edinburgh and Ireland and serves as the chief cardiologist, holding the chairs of the department of cardiovascular sciences and cardiology council at the Fortis Healthcare. Seth, a recipient of the Order of Isabella the Catholic, was honored by the Government of India with the fourth highest Indian civilian award of Padma Shri, in 2003, followed by Padma Bhushan, the third highest Indian civilian award, in 2015. Donald S. Baim was a researcher and clinician in the field of interventional cardiology. Baim's primary research focused on coronary blood flow, catheter intervention in heart disease, and congestive heart failure. His work helped to shift the use of catheters from a purely diagnostic tool to a therapeutic tool. After receiving a medical degree from Yale and initial medical training, residency and a fellowship at Stanford University Medical Center, Baim spent the bulk of his career at Beth Israel Hospital and at the Brigham and Women's Hospital in Boston. In 1993, Baim founded the Beth Israel Hospital's Cardiovascular Data Analysis Center (CDAC) -- later to be named Harvard Clinical Research Institute (HCRI). Baim died of cancer in November 2009. In October 2016, HCRI changed its name to the Baim Institute for Clinical Research. The Quaid-e-Azam International Hospital (QIH) is a private hospital in Islamabad, Rawalpindi, Pakistan. Founded in 2011 by Dr. Shaukat Ali Bangash MD, Diplomate American Board of Internal Medicine, Diplomate American Board of Infectious Diseases, the hospital provides a broad range of secondary and tertiary care, including diagnosis of disease and team management of patient care. National Institute of Cardiovascular Diseases in collaboration with the government of Sindh has established its fifth state-of-the-art satellite center at Sukkur. This health facility was inaugurated by Bilawal Bhutto Zardari, along with Syed Murad Ali Shah and Syed Khurshid Ahmed Shah. It is a tertiary cardiac care Hospital under the ambit of National Institute of Cardiovascular Diseases Rafiqui Shaheed road, Karachi. The hospital is located in the Northern part of Sindh Province at Sukkur and is attached with Ghulam Muhammad Mahar Medical College. It is the second largest Cardiac hospital in Sindh province only after the main NICVD Rafiqui Shaheed road, Karachi, having 300 beds for indoor patients, besides Emergency services and cardiac intensive care facility. The Sukkur center of National Institute of Cardiovascular Diseases (NICVD), have performed its first open heart bypass surgery of a female patient with atrial septal defect (ASD) on Saturday, 10 March 2018 under the supervision of Prof. Fazle Rabbi. NICVD inaugurates its 2nd state-of-the-art 'operation theater' on 9 November 2018.